Where do you stand on this? It probably depends on how seriously you take your sports. The baseball season was only a few weeks old when a sports blogger lambasted Texas Rangers pitcher Colby Lewis for missing a game in which he was scheduled to pitch, in order to attend the birth of his daughter, Elizabeth Grace. Lewis, 31, was the first player to go on Major League Baseball's new paternity leave list. A player can be on the list, and off the roster, for up to three days for the birth of a child. 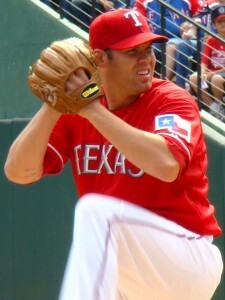 "Baseball players are paid millions to play baseball," Richie Whitt wrote in a post for the Dallas Observer sports blog. "If that means 'scheduling' births so they occur in the off-season, then so be it. Of the 365 days in a year, starting pitchers 'work' maybe 40 of them, counting spring training and playoffs. "If it was a first child, maybe. But a second child causing a player to miss a game? Ludicrous." Twitter and blogosphere lit up with sputtering rebuttals: Fatherhood trumps baseball any day, buster. The Rangers' pitching coach, Mike Maddux, said he supports the new list. "I'm going to be honest here, as I have been since the first time this came up, some years ago (official paternity leave is new, but players taking a game off to attend childbirth is not)," he wrote. "As a human being, I think this is fantastic. As a baseball fan, though? If my team's in the playoff hunt, I'm sorry, but I don't want one of my starting pitchers taking the night off. We're not talking about some guy who works on the assembly line for the Integrated Widget Corporation. We're talking about one of the most talented pitchers on the planet, not easily replaceable. What if your team finishes one game short of the playoffs? Was it really worth it? "Or as a sage philosopher once observed, The needs of the many outweigh the needs of the few. "And last I checked, there were many fans of the Texas Rangers." Well, it's not just the Texas Rangers anymore. Several other players have already gone on the list, including the Oakland Athletics' catcher Kurt Suzuki, Washington Nationals' shortstop Ian Desmond and New York Mets' left-fielder Jason Bay.